I often find myself hungry in the late afternoon, especially during the work week. I sometimes opt for a bag of frozen blueberries or a frozen banana, but every once in a while I want something more crunchy, and less sweet. On these occasions a small serving of chips usually fits the bill. I have a few chip favorites that I have posted on before, including Kettle Baked Chips which are really good, and of course, my old standby, tortilla chips. But I recently found another chip that lives up to all of my expectations for a healthier version of the potato chip – Food Should Taste Good Chips. Ah, the name says it all! How could a food lover pass a display of chips in the health food aisle that is made by a company called Food Should Taste Good? Let’s face it. Much of the stuff that is marketed as healthy doesn’t taste good. Some of it is flavorless, and some is just downright un-yummy and tastes like cardboard. I saw the Food Should Taste Good Buffalo Chips at Whole Foods Market and just had to give them a chance, especially since one of my followers had said that she tried them and they were yummy. If the name of the company is a marketing gimmick, it is definitely working! So, out of the bag, these chips are definitely aptly named. They are very good, and a serving is only 4 weight watchers points plus points! I have only tried the Buffalo flavor, which was, very Buffalo-ey but not what you’d call “hot” yet very delicious. These chips are made with all natural ingredients and they are baked, not fried, a must if you want to keep your arteries free-flowing, right? They are also free from trans-fats, cholesterol, GMOs and gluten. They are low in sodium and certified Kosher. Wow! That’s certainly a lot for this little bag! In addition to the very buffalo-ey Buffalo, there are also six other varieties including Sweet Potato, the Works, Olive, Multigrain, Jalapeno – and (did they dare?) chocolate! 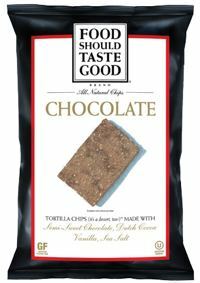 Each one ounce serving of these chips that are very deserving of their name has 140 calories and three grams of fiber. They can be found in all sorts of natural food markets, as well as online at Amazon. Yummm I like those chips!